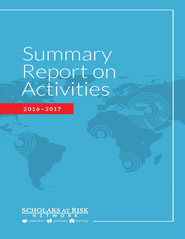 The Summary Report on Activities is the first installment outlining SAR’s annual activities for the fiscal year spanning September 1, 2016 – August 31, 2017. 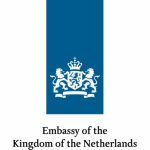 It covers the growth of our global network and our core work in protection, advocacy, and research & learning (values-promotion). A financial summary indicating increasing demand for SAR’s work and services is also included. 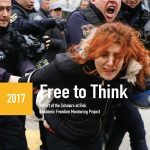 Scholars at Risk has released Free to Think 2017, an annual report analyzing 257 reported attacks on higher education communities in 35 countries, from September 1, 2016, to August 31, 2017.